Amy Mary Irvine’s The Frantic Misfortunes of a Nurse, or, The Probationer is a romance novel published in 1910 by S.W. Partridge in London, England. Illustrated by the prolific, but little-known, artist Percy Bell Hickling (see fig. 1), it follows the story of a young woman’s ascent from the position of graceless and spoiled probationer to assistant nurse at a children’s hospital. 1910 also signals the end of the prosperous Edwardian era, an (approximate) decade of peace characterized by its shift away from Victorian morality and featuring the beginnings of Modernism. Britain’s entrance into the First World War in 1914 dramatically changed British economy and industry, and the roles of women changed with it. Both authors and readers of the Edwardian era were straddled between two perspectives, and the Great War changed this perspective into the Modern era. The Probationer reflects Victorian ideas of femininity, maternity and romance. The novel is characteristic of popular Edwardian romance as it reinforces the ideal, but mandatory, behaviour of a woman as she enters adulthood. However, the novel also shows characteristics of the Modern, anticipating women’s rights by portraying an independent and gifted female protagonist’s professional and personal coming-of-age. The novel, like the Edwardian Era, straddles the past and the future and combines seemingly opposing sensibilities that reconciles the fantasy and the real. prep school lessons (see fig. 2). The societal context of the reader in post-war Britain would affect a reading of the novel, allowing a re-interpretation of the female protagonist that would foreshadow medical fiction, women’s rights and the rise of literary feminism. The popularity of romance novels continued into the Edwardian era in their Victorian era form, and Edwardian perspectives of femininity were continuing Victorian ideas (Kullman 74). 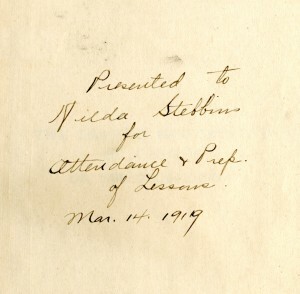 The Probationer, while a traditional Victorian formula romance, appears to have had a continued readership throughout the 20th century due to the copy’s inside cover inscription. The post-war reader differed greatly from the Victorian or Edwardian, and this longevity allows the book to be reinterpreted as a Modernist romance. The Probationer follows the story of an idle young woman from a wealthy family as she attempts to become a nurse. She envies an older family friend’s nursing occupation, and so she decides to become one herself. Her fantasies of rewarding, glamourous work are immediately dispelled upon her arrival, and the work proves to be gruelling and difficult. Her previous idleness is reflected in her ineptitude, and she drops pans, burns lunch, and endures all other sorts of mishaps that initially cause her to feel shame but contribute to her growing humility (see fig. 3). During these mishaps she begins to receive the teasing attention of the hospital’s leading doctor, Mr. Fleming. A fellow probationer tells her that Mr. Fleming is her fiancé, and Agnes is heartbroken until he refutes this claim. He confesses his love for her, and they decide to become engaged once she finished her term. The pro eventually receives the glowing compliments of her superiors, and decides to stay on at the hospital (fig. 4). P.B. Hickling illustrates the six black-and-white plates included at key moments in the book. Each one shows Agnes Atherton at various moments in her journey from probationer to signed nurse. The Edwardian Era is not exactly a literary era, and romance is not exactly a literary genre (Hynes 1). Critics are rarely in agreement to the definition of either, as the Edwardian Era extends to either 1910 or 1914 (Hynes 1), and definitions of romance are often reduced to a collection of features (McCracken 79). Virginia Woolf explains Edwardian literature as existing as a genre between genres (Hynes 9), and Edwardian romance novels straddled Victorian ideas of womanhood with the early shadows of Modernity (Hynes) and, ultimately, feminism. An Edwardian romance novel contained features of both prescribed Victorian propriety and the reinterpretation of femininity and womanhood of the war years and Modernity. The Probationer quintessentially represents the features of a romance novel. Agnes is the perfect misunderstood heroine (the femme incomprise) (McCracken 78). Her object of desire (her fabula) is seemingly unattainable (barriers, or sjuzet). Only her ultimate acceptance of subordinate feminine to masculine authority allows her to overcome the barriers and receive her object of desire (McCracken 86), and she achieves this when she transforms into the idealized woman. Agnes desires the love of Mr. Fleming, but it is also apparent that she desires acceptance and success in her profession. While her desire of the masculine authority figure is characteristic of the formula romance, Agnes’ self-actualization occurs outside of her romantic interests and this ultimately allows for a re-interpretation of the novel beyond Victorian tropes. The “outside” barrier to Agnes achieving her object of desire, Mr. Fleming, is Agnes’ fellow probationer Nurse Cotteril. Agnes’ peer confides in her that she is engaged to Mr. Fleming and this revelation sparks Agnes’ jealousy and passion for Mr. Fleming. Nurse Cotteril forbids Agnes from revealing this secret, citing a loss of position and stature for both herself and Mr. Fleming should their secret be exposed. Agnes’s jealousy thus has no outlet, and she translates this discontent into passive aggression towards her friend and Mr. Fleming (see fig. 5). Women are thus seen as competitive and spiteful, according to Victorian theories of biological determinism that explain the “natural” differences between men and women (Tanenbaum 60). Agnes, as the romantic heroine, is a representation of the typical, but imperfect, Victorian woman, and this imperfection is her sjuzet. Agnes is also indiscriminate in her feelings, and these feelings translate into giddy and consuming preoccupation with her male object of desire. Rafford Pyke, in a 1901 treatise on “What Women Want in Men” explains that young, inexperienced women “flutter and blush” when the object of their affection is nearby, and that this is a distinctly British trait (46). Moving through her early years of maturity, the young woman is attracted to men of distinction, who inspire deference and admiration in their peers, rather than good looks (Pyke 47). As Agnes rarely comments on the attractiveness of her object of affection, her love for him appears to stem from his unattainability as both an engaged man and a learned doctor. The unattainability of Mr. Fleming underlies the conflict in the novel, and this conflict is mirrored in Agnes’ failure to be a proper, domesticated probationer. Agnes’ “misfortunes” are also a feature of romantic fiction, as these represent an “inner” barrier to achieving her object of desire. She is the femme incomprise (Pyke 47), an identifiable and pitiable figure to the reader of a romance novel (McCracken 90). Agnes casts aside the traditional conventions of both the hospital and femininity by speaking her mind and displaying her ignorance. At first, these frank utterances are laughable, and her demands for the comforts of her previous life are juxtaposed with her domestic failure in the new setting of the remote children’s hospital. As she grows to be less demanding and more competent, her tactlessness becomes an endearing feature to the characters and the reader. By the end of the novel she receives praise from the head doctor, the head nurse, and her Mr. Fleming. This is the result of her transformation into the ideal woman while retaining her status as femme incomprise, the misunderstood woman that the reader identifies with. These two barriers represent Agnes’ struggle to find love, which create the conflict in the novel. The barriers stem from her non-idealized feminine immaturity, and her maturation reflects contemporary ideas of the ideal woman in Victorian society. Agnes’ barriers in the novel highlight the Victorian and Edwardian conceptions of girlhood, maturation and femininity. Pyke refers to young, maturing women as “young girls” as the stage of “young adulthood” did not exist as we know it today. But children’s literature was a popular and surging genre of the time due to the growing acceptance of the child as a life stage and the rights of children expanding beyond the idea of required duty (Darton 299) The Victorian era abounded with classic, canonical children’s literature (Darton 293). 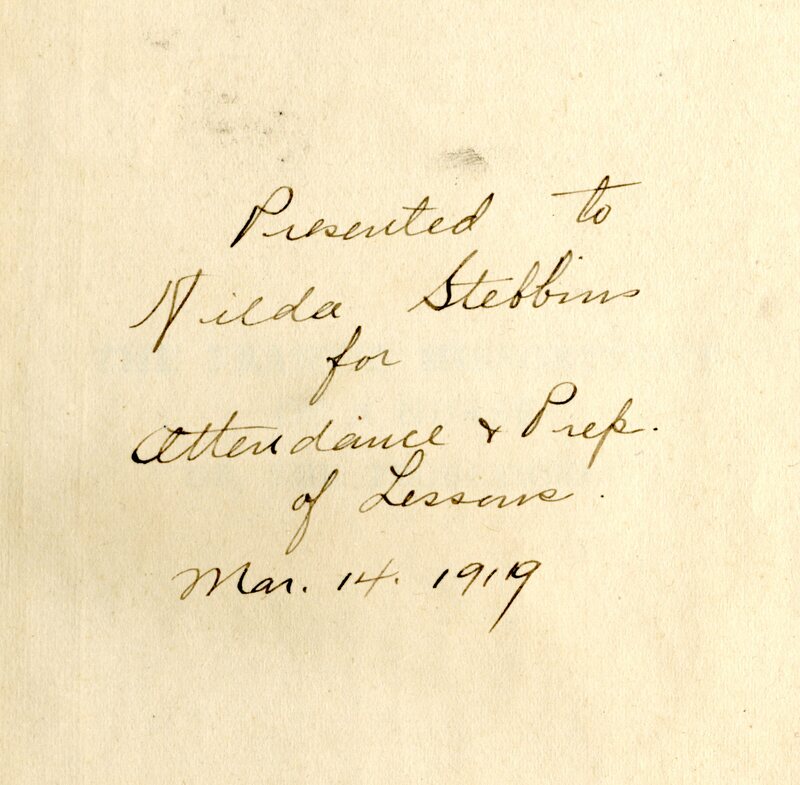 Contemporary belief held that girls read more literature (Darton 305), and gift books were more often given to female children as novels were thought to be more accessible to girls (Darton 305). Tales for girls were written about adults, as girls were seen as more mature (Darton 305), and the stories took place in “adult” spaces. Darton calls this the shifting of the age curve, arguing that that girls grew up quickly in the Edwardian era. The onset of World War One for Britain definitively changed the remaining Victorian values of the early 20th century and ended the Edwardian era, and this impacted how women and children read literature after 1914. Women began participating on the home front by supporting the men who went out to fight. The growing unequal gender distribution on home impacted the lives of children growing up in the early 1900s. Patriarchal lineage and household organization was questioned due to the lack of male adults in the home. This experience of young readers mirrors the experience of Agnes for multiple reasons. Agnes is transplanted into an intimidating occupation, and she is surrounded by women who offer little sympathy for her ineptitude and unfamiliarity with her new situation. Young readers would be suffering the loss of the familiar leadership of brothers and fathers, and The Probationer’s heroine is relatable in both her sudden loss of contextual familiarity. As a nurse, she also represents the new representation of women in the workforce. Agnes leaves her home for her fantasy of noble work as a nurse, and has this fantasy replaced by a realistic, but still rewarding, occupation. 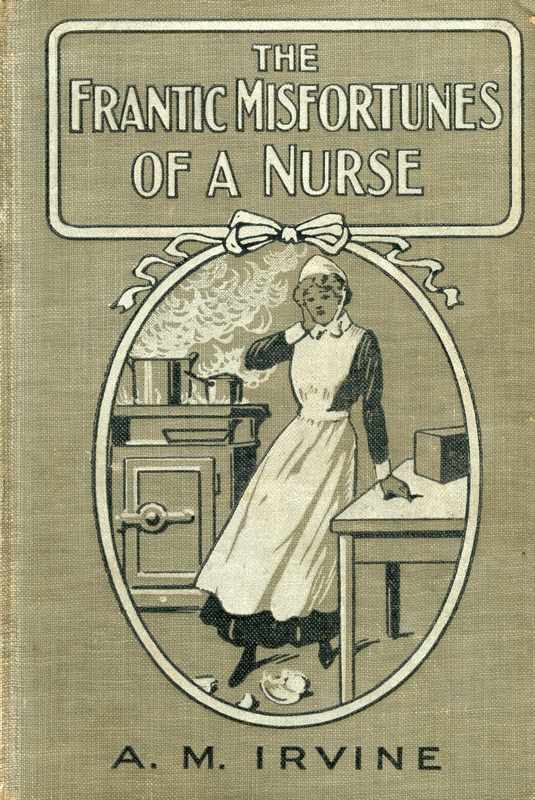 Young women who acted as nurses were revered and romanticized, and those who read the book would also relate to the difficult, exhausting work that it was. However the book would still act as escapist fiction, since the nursing involves ill children, not war-torn soldiers, and it is not bloody or gory in any sense. It combines what McCracken explains as the romantic realism, the combination of real life into a romanticized and idealized setting. In this sense the novel still offers the satisfying children’s entertainment, but readers post-war would have engaged with Agnes’ profession in a unique way to readers of the Edwardian period. She leaves the comfort of home for the noble cause, and this mirrors the showing of literature that says women should work outside of the home to support the troops. She believes in the noble cause despite the initially hard, unrewarding work, and its ultimate role in her happiness acts as propaganda for helping the nation achieve its war goals. 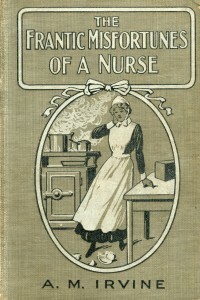 Nursing itself becomes an interesting position of the book, as nursing was a popular and gendered occupation in the war. The detailed aspects of nursing shown in the book foreshadows the rise of the genre of medical fiction. 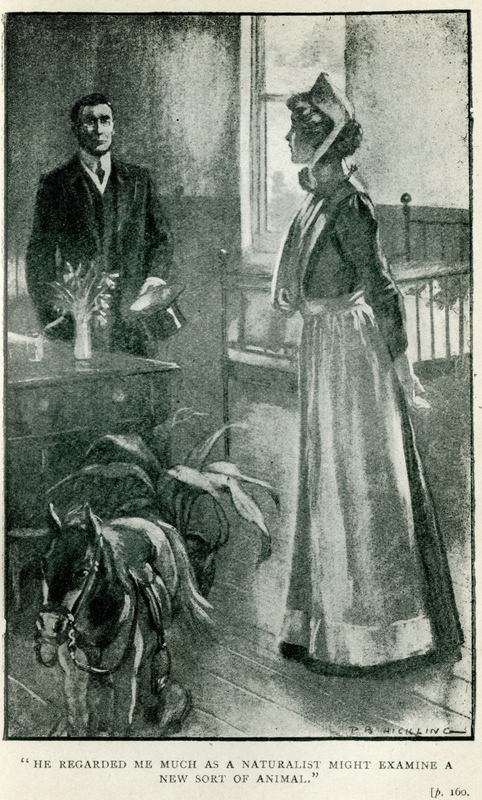 The Probationer, as an Edwardian formula romance published on the cusp of the Great War, can be read as both a Victorian and a Modern novel, which prompts unique readings. 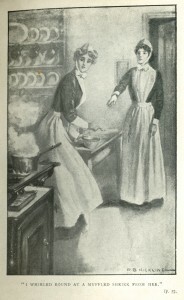 As a product of the Victorian era, the novel can be seen as an affirmation of what was deemed to be proper women’s behaviour and the general role of a working woman in society. 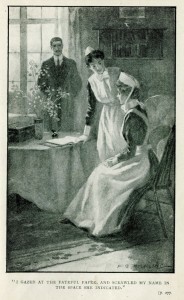 However, as the book was given to a young women in 1919, it can also be seen as a wartime or post-war story championing the independent heroine as she grows in her profession as a nurse. Darton, F. J. Harvey. Children’s Books in England: Five Centuries of Social Life. 1932. Ed. Brian Alderson. 3rd Ed. Newcastle: Oak Knoll, 1982. Print. Century. London: Routledge. 1972. Print. S. W. Partridge and Co., Ltd, 1910. Print. Books.” Ed. Anne Lawson Lucas. The Presence of the Past in Children’s Literature. Westport: Praeger, 2003. 73-80. Print. McCracken, Scott. Pulp: Reading Popular Fiction. Manchester: Manchester UP, 1998. Print. Romance: A Reader. New York: New York UP, 2001. Print. Tanenbaum, Leora. Catfight: Women and Competition. New York: Seven Stories P, 2002.